every time I try to upload a document onto my player I get the error message below. I think I had this problem before but cannot remember what I did to fix it. I'm sorry about the odd behavior with your uploading, and based on your image I see you're also working on a Mac - so you'll want to confirm you're working with the .story file and any linked files from the local drive of your Windows environment as described here. If the behavior persists, even on a brand new file, you may need to conduct the repair of Storyline. We are sorry you are experiencing this issue. We have had similar threads in the past. 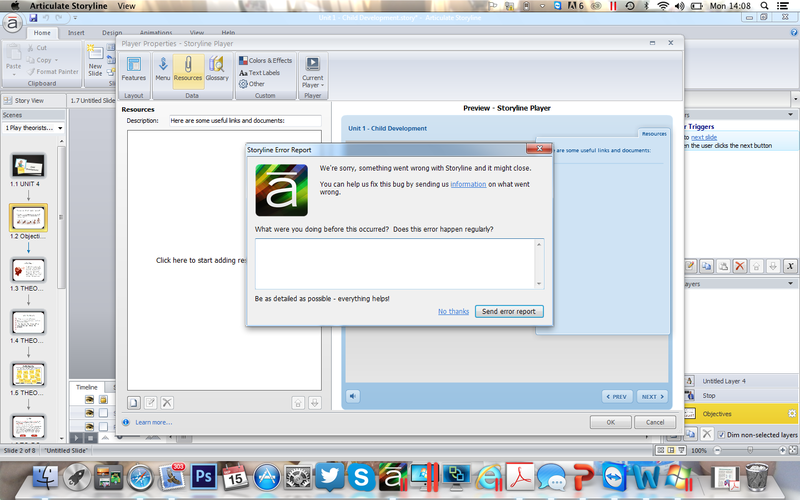 You can also try importing your Storyline files into a new project. If this does not help, you could try a repair of Storyline. Thanks I installed etc and it made no difference. I think the path to the document was too long. I then saved the document onto my desktop and it uploaded fine. Thanks Inka for the update and I'm glad you were able to figure it out in terms of the file path length.